Giving Tuesday brings together people, nonprofits, families, and businesses across the country to give to charitable organizations and share their resources with those in need. Since 2012, #GivingTuesday is celebrated on the Tuesday following Thanksgiving, Black Friday and Cyber Monday. The day kicks off the giving season in the US as charitable giving increases throughout the holiday season. There are many ways, besides giving money, that one can give to those in need on Giving Tuesday. These ways include giving a helping hand to someone in need; volunteering at a hospital, meal kitchen, etc. ; giving food to the homeless. Giving Tuesday is about these and countless acts of generosity that can brighten up a smile or change a life. Over the years, PfD has been fortunate receive Giving Tuesday donations from numerous supporters, which has enabled us to continue our impactful work. Our work includes water and sanitation improvements in Nigeria, developing the pineapple value chain in Benin, and developing interventions for malaria prevention and control in Cambodia. Not only do we aspire for these communities to be healthy and economically empowered, we want these changes to be sustainable. As a result, we work closely with local organizations in these communities. One of our most impactful projects is WADA, which is being implemented in Nigeria. Through WADA, PfD is ensuring that communities in Abia and Cross River States gain improved access to clean water and sanitation facilities. We are working to build water and sanitation facilities in 58 rural communities in the two states. Nma Oyebiya is one of the beneficiaries who could not afford to construct a pit toilet due to his low income. PfD, with the support of community leaders and Water, Sanitation and Health Committee (WASHCOM) members, constructed an improved toilet for community members such as Nma. 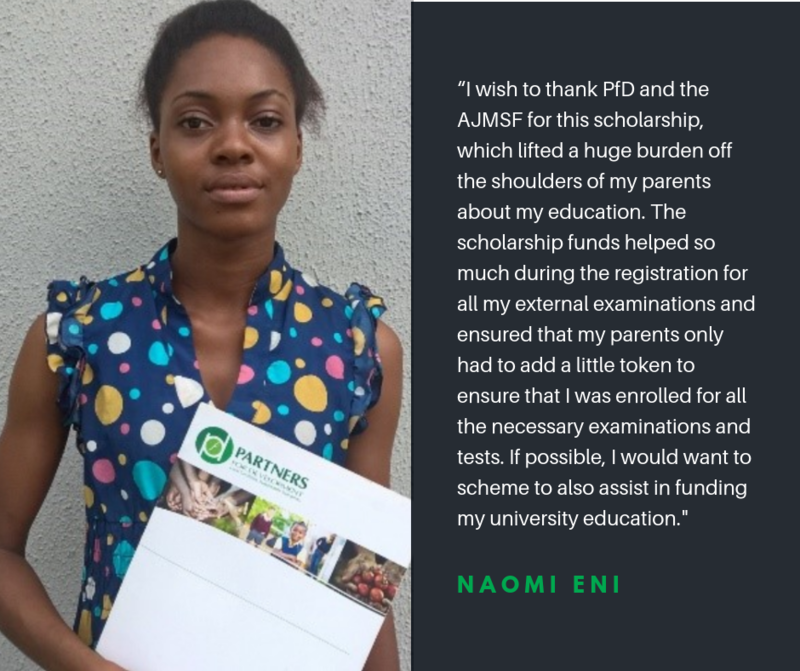 In addition to WADA, PfD supports girls’ education in Nigeria through the Anne Johnson Memorial Scholarship Fund (AJMSF). The AJMSF provides scholarships for girls who are at the middle and high school levels. This scholarship is a great source of support for poor and low-income families who want to educate their girls and broaden their future opportunities. Additionally, the AJMSF helps to remedy the disparities in the education of boys and girls in Nigeria. We are proud of our outstanding work and couldn’t have done it without your support. We implore you to, once again, choose PfD as your Giving Tuesday beneficiary. Visit our site to learn about the work that we do and the impact that your donation will have on underserved communities. Your support on #GivingTuesday, and every day, allows us to expand our impact. Thank you for your generosity!